Thirty-five year old Divya Bhandari was born with a severe hearing impairment. Today, in spite of being unable to hear or speak, she has no qualms about confidently approaching people with a bright smile and handing over her business card for Divya Soft Toys, an initiative she took to venture into the world of business thus making her self-reliant and financially independent. Being handicapped in India is discouraging due to scarcity of good jobs for challenged individuals. Despite her limitations, this Andheri resident has completed her SSC from the state board and went on to complete her diploma in Home Science. In addition, she developed new skills by enrolling herself in short term Yoga, beautician, soft toy making and computer courses. Her small home-run business enterprise keeps her totally occupied. During the lean season, she prepares herself to organise exhibitions and to sell her soft toys during the busy seasons. “I am completely independent. I can travel all over the place even in an auto rickshaw without getting cheated,” says Bhandari in sign language. “I do my own shopping and purchase things only on maximum retail price,” she adds. 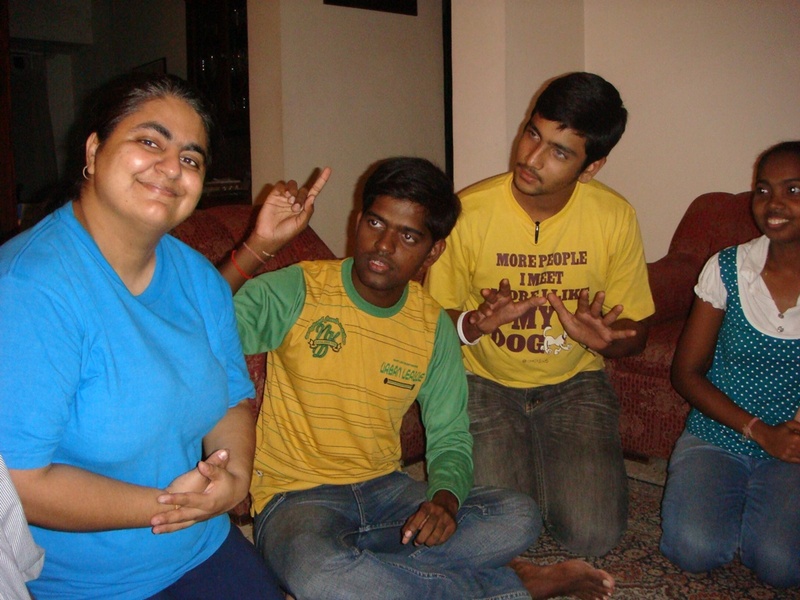 Bhandari is blessed with many friends who have hearing impairment and they have all come together to form a support system for one another and for other individuals with such impairments. Pragati Shah and Ashutosh both aged 21 recently joined the group. While Ashutosh is currently taking lessons in computer animation, Shah has successfully completed her graduation in Economics. “All this while I used to travel alone by bus from my home in Andheri to college in Malad. It is only now that I have started going out with people like me and learning to become self reliant,” says Pragati Shah. The oldest in the group are 40-year old Ajoy Kumar and Mandeep Chawla. Kumar is married and works at a petrol pump. 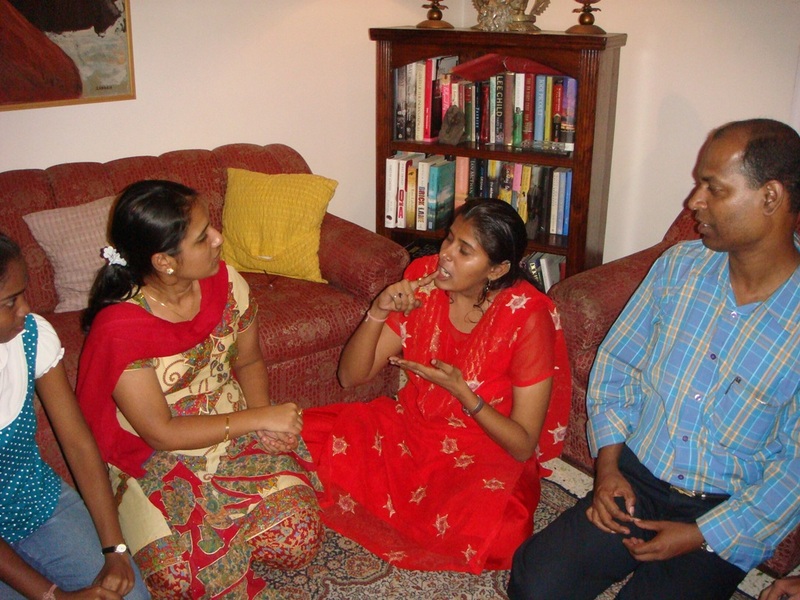 His wife and children are hearing individuals and have learnt both the American Sign Language and the Indian Sign Language to communicate better. Chawla studied at the English Language Institute at Gallaudet University in Washington D.C. He is currently involved in his family business. Despite of their limitations, these individuals make an earnest attempt to speak. For Bhushan Yadav and his younger sister Shweta Yadav, their parents were very strict and did not allow them to completely depend on sign language. Instead, the brother-sister duo studied in a regular school and can converse with speech irregularities. Today, Bhushan works as an editor for a popular television production house and Shweta is in college. Among the hearing impaired, age is no bar. “Even though I am 40 and the youngest one is just 21, there is no generation gap between us as we can connect with each other very easily. We hang out together and help one another,” says Ajoy Kumar. “Our condition brings us closer to each other,” adds Chawla. Kumar, Chawla and Bhandari being the older ones have seen much of life and often help the younger ones in all ways whether it is looking out for a job or even if it is about self reliance and independence for daily living. “The mobile phone has helped us tremendously. Since we cannot speak on the phone, SMS is the biggest blessing to us,” says Vaibhav Darkonde who assists a doctor. “Earlier we used to ask out family members to pass on our messages to one another but now, we plan our meetings and outings on our own through SMS,” adds Radhika Goyal. One of the biggest hurdles these hearing impaired individuals have to tackle is lack of disabled friendly facilities. “I completed my Std. X from a school for the deaf in Juhu but I had to move to a regular college as there were no colleges exclusively for the deaf,” says Pragati Shah. “However, my classmates and professors were cooperative. I used to copy notes from their books and if I had doubts used to write down my queries to my professor who used to reply in writing,” she adds. This group of hearing impaired individuals meet informally every alternate Sunday in Andheri. The main purpose of the group is to form a support system for one another and to extend it to others like them.